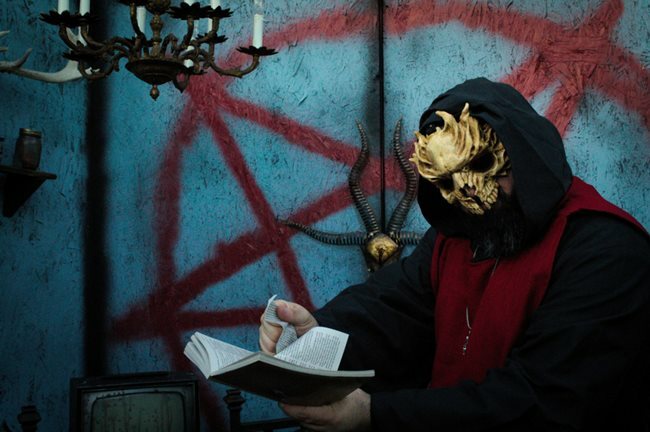 Created by former managers from the Haunted Graveyard at Lake Compounce, which last year I called New England’s #1 attraction, Evidence of Evil goes well beyond most Halloween attractions in its interactivity and theatricality. I’ve reviewed some 50 Halloween attractions in New England, and mainly the actors dressed as monsters try to startle you, jumping out with a yell. Sometimes, actors will have a line or two to say, but then you continue on your way walking past. Signage as you approach is not good. 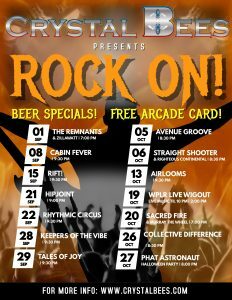 You need to know that the attraction starts at Crystal Bees, an arcade that is around to the left of the parking lot. I’ve seen many arcades in New England, but they are often too kids-oriented, embarrassingly run down looking, and serve bottom-level pizza and fried foods. And I’ve been to attractions such as Lucky Strike Boston, which is too much a dim light pick-up scene centered around alcohol. Crystal Bees is a refreshing break from these pigeonholes. It’s an enormous, arcade hall filled with videogames, restaurant tables, bowling, bocce, and three bars. But it’s upscale looking, with proper lighting, and has a full kitchen and a calendar of live music. It’s remarkable! The ceiling of the giant warehouse space has anechoic foam. It’s nearby Lake Compounce and Haunt on Eden, so perfect for a night visiting all three. You buy tickets at the Crystal Bees front desk for a timed entry every 15 minutes. This means there’s no waiting in line, freeing you to have dinner or play a game while you wait. To begin, they place hoods over visitors’ heads and then have you walk, arms on the shoulders of the person in front of you, for 8 minutes. They sanitize the hoods between each tour and wash them nightly. You would think that being hooded would be intensely scary, but for safety’s sake they take such care, and because you can’t see anything to be afraid of, it’s less spooky than you would think. (I’ve had a similar experience at “lights out” Halloween attractions in total darkness. 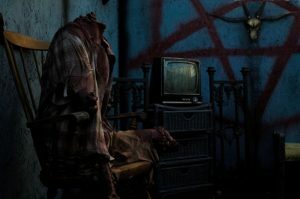 By their nature, haunted houses are cheesy and silly, and an audio experience without visuals doesn’t seem to be enough to replace snickering with fright.) Larger hoods would be easier to put on and less risky to pull off without snagging someone’s hair, or better yet, blindfolds, or nothing. The walk basically serves to get you through the parking lot to the actual attraction. Then you walk another 13 minutes through a haunted maze of 3-minute, theatrical vignettes. In each room, actors engage you directly, taunting you or ordering you to obey their wicked rules. The set design is low budget, just plywood, but they’ve made the walls look weathered, and decorated the rooms densely with paintings and furniture. This creates the illusion that you are in a real building. (You don’t even notice that, for fire safety, there is no roof, just stars above you.) Partly the walkways have filler such as hanging cloth strips, and some costumes are just bloody street clothing with masks instead of makeup. But you’ll also see impressive elements such as a crib with a skeleton, a mannequin gargoyle, a chainsaw monster, and a spectacular “lake of light” made by a plane of laser light and fog. It’s my favorite haunted effect and I’m glad to see expand to more locations, including Barrett’s Haunted Mansion, Fear Town, the 13th World, and the Haunted Graveyard. The densely decorated rooms and theatrical set design very well disguise the plywood. You join a feast ceremony where a visitor must pluck the beating heart from the human corpse on the dinner table. In another room, goat headed demon worshippers force you to speak of your sins — weirdly, some visitors didn’t get the roleplay and talked about what seemed like their actual sins. Guys! Make something up for fun! Perhaps a slightly different question would hint that visitors should play along. In another place, you must knock on a coffin to see what lies in store, or search for a key to escape from a room of ghouls. 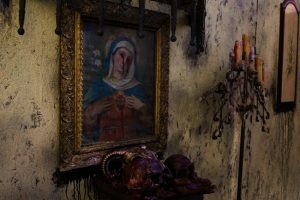 The attraction has a mountain of props, making it a visual spectacle, and the acting and Satanic theme were moving and powerful. That being said, shouted profanity and the harsher insults added nothing to the experience for us, and it limits the age of the audience attending, perhaps why you don’t see it at Halloween attractions. Afterwards, they give you a survey for your thoughts and feedback. This is a recently created attraction which they hope to expand and improve. Evidence of Evil was a short experience, but it takes place at a large arcade attraction, and despite its low production budget is one of the most theatrical and original Halloween experiences that I’ve had anywhere. For its future potential I’ll give Evidence of Evil 4.5 stars.